You may be prompted to install Apache and MySQL if you don’t have them installed. You will prompted to select the webserver for which Cacti should be configured; select the appropriate one and then if MySQL is being installed, you’ll be prompted to set the MySQL ‘root’ user password. 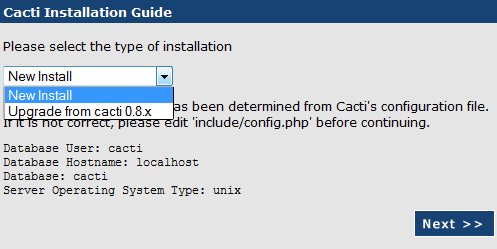 The cacti package must have a database installed and configured before it can be used. This can be optionally handled with dbconfig-common. Configure database for cacti with dbconfig-common? Please provide a password for cacti to register with the database server. If left blank, a random password will be generated. Configure the options and paths, if any paths are not filled in, do a “which” on the command line of the server you’re installing on, and it should give you the full path. If it’s not installed, install it with apt-get. Log in with the username admin and password admin and you will be prompted to change the password. MariaDB can be used instead of MySQL if you’ve already transitioned to it from mysql. Edit the file /etc/cron.d/cacti to uncomment the cacti line. install and configure Network Weathermap and tell it to use your cacti (or mrtg etc) data so you can get a nice realtime(-ish) graph of your speeds and feeds. I’m a big fan of Network Weathermap, so I thought this addition, http://lesser-evil.com/2016/06/rack-diagrams-with-weathermap/, to add rack diagrams to NW, to be pretty great. It makes a great addition/companion to Cacti, about which I’ve written before. It can be kind of finicky to get everything working, but when you do, it’s pretty great.